Cooler Master officially announced the GeminiII SF524. This cooler has been available in retail stores for some time now, but the company wanted to wait until CES to properly announce it. The cooler has a copper base, five heatpipes, aluminium fins and a 120mm long-life sleeve fan that spins at 1300RPM with an airflow of 52.6CFM (36.4CFM at 900RPM with silent mode adapter), a static pressure of 1.14 mm H2O and a noise level of 22.5dBA. The product measures 144 x 144 x 105mm with fan and weighs 490g. It's compatible with Intel's Socket LGA1366 / 1156 / 1155 / 775 and AMD's Socket FM1/ AM3+ / AM3 / AM2+ / AM2. If you are looking for an efficient and silent solution to cool not only your CPU but your Memory and Mainboard as well, GeminII SF524 might be just what you need. Instead of purchasing several Case Fans that consume around 5W each and add to the Systems noise, no matter how silent they are, GeminII SF524 takes advantage of the fresh air entering through the side panel. This saves you not only money and hassle, but results in a quiet, cool and efficient System. It cools the CPU and circulates the air over the main components around the CPU socket until it gets carried out of the case by the PSU or rear Case Fan. 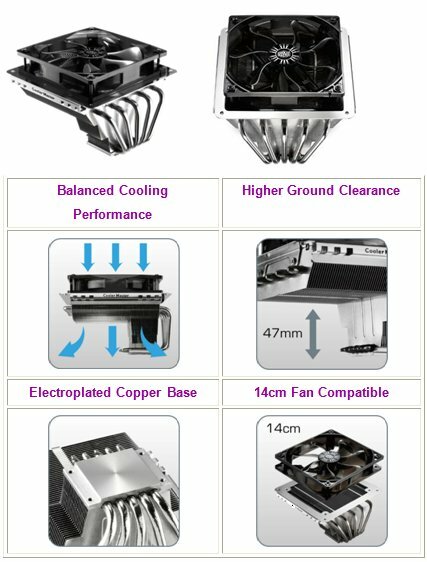 The GeminII SF524 is the ideal 90° airflow CPU Heat sink with an extended fin system and airflow optimized design to help keep your memory and other critical motherboard components nice and cool, resulting in a longer lifespan of your computer. Cooler Master’s GeminII SF524 is a unique alternative to CPU & Motherboard component cooling, instead of pulling in stagnant hot air flowing around the Motherboard it features a 90° airflow design that retrieves cool circulating air from the side of your system and uses it to cool the CPU Fins while also blowing fresh air over the critical CPU PWM and your main System memory. GeminII SF524 features a larger Heat sink for improved cooling performance, and increased memory module clearance to support high end memory modules featuring large Heat sinks of their own. It comes equipped with a modular 120mm fan with a low noise performance ratio and can be configured to run in super low noise mode with the bundled silent mode adapter. It can be upgraded to a 140mm fan to further boost its cooling performance or opt for a super low noise, low rpm fan. GeminII SF524 features a total of five high-grade 6mm thick copper Heat pipes emerging from a thick copper base for optimal heat conduction, quickly spreading and removing heat generated by the CPU. To prevent corrosion of its copper surfaces without impacting its heat conductivity, the base and all heat pipes have been electroplated with a microscopic layer of nickel. The increased surface area of the Heat sink and revised Fin design of GeminII SF524 not only improve its cooling performance but enable the installation of 140mm fans possible, making it a highly flexible all-round cooling solution.